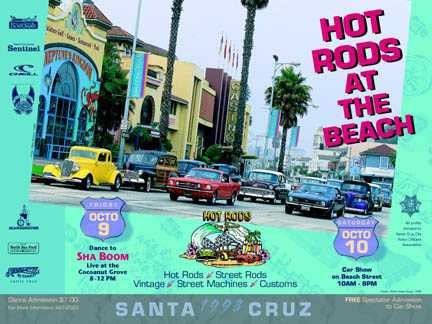 "Hot Rods at the Beach" is quickly becoming a tradition at the Santa Cruz Beach Boardwalk. This first annual poster reflects the era when hot rods and woodies would cruise the beach on weekend nights. Special touches of hot rod speed parts make up the background behind the classic photo by Bob Barbour.